King's Stand Stakes favourite Star Witness put in a "super impressive" barrier trial before boarding the plane from Australia and will take plenty of beatingat Royal Ascot on Tuesday if back to his best form, trainer Danny O'Brien said on Thursday. Melbourne-based trainer O'Brien, speaking at a press conference in Newmarket, said the son of Starcraft could also contest the Golden Jubilee Stakes at the royal meeting on Saturday week as part of a "grand finale" before retiring to stud. O'Brien said: "If Star Witness turns up in the form he was in for Melbourne Cup week, which I hope he is, then he is going to be hard to beat. He is also six months older and stronger from then. He was super impressive in a barrier trial before getting on the planeout here. "He's taken the trip over here pretty well, given it's 38 hours door to door. We like to ship the horses on the plane race-fit and we'll just give him one more gallop tomorrow [Friday] to put him spot on for Tuesday." 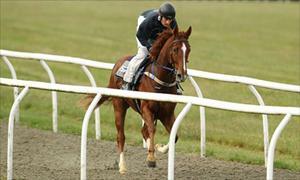 Star Witness is 4-1 favourite for the King's Stand Stakes which could feature runners from eight nations. It is a race O'Brien has had in mind for over a year. "Coming to Ascot has been at the back of my mind ever since he won his second start and we've been pretty conservative with him this season because of that," he added. "He's only raced twice since Melbourne Cup week in November and that has been by design because I was thinking that the races that would really suit him were up here. "When he ran in the Newmarket Handicap at Flemington last time, there was a Top Gear car rally next to the track and, like a lot of the horses, he got very worked up and ran his race before he started. "I've been over here before and got beaten but didn't want to come back again unless I had one with a good chance and I think I've got one now. "He's going to be covering mares [at Widden Stud] in September and next week is going to be his grand finale. It would be good to finish his career with a big exclamation mark." Steven Arnold will take the ride and was dubbed by O'Brien as "an outstanding rider" who won the 2009 King's Stand on Australian challenger Scenic Blast. "We'll be happy to stalk close enough to the pace in the King's Stand because you don't seem to be able to make up a lot of ground in the race," O'Brien said. "The prize-money is good for these races, £400,000 for the Golden Jubilee would be good in any jurisdiction, but with a colt there is much more than prize-money involved - it can make his stud career if he wins a Group 1 race."